Iwaki uses injection molding technologies to manufacture trays for packing, processing, storing, and transporting optical, electronic, precision, and other components. We also handle everything from the design to the coordination of mold manufacturing and fabrication for original products. Our motto is “Creating the molds that turn dreams into reality!” Injection molding technology, in particular, contributes to development not possible with other technologies, such as the mass production of products with complex shapes. We will continue to strive to flexibly meet the needs of society, which are expected to grow more and more complex. What is injection molding technology? So, what is injection molding technology? Briefly put, injection molding technology is a forming technology in which heat-melted material is injected into a mold, cooled, and hardened. Products are continuously produced through processes such as mold clamping, injection, and pressure holding. One of the advantages of injection molding technology is that it can mass-produce products with complex shapes. Iwaki, in particular, has installed the latest machining centers to meet customers' diverse needs. We will continue to refine our technical abilities to further improve our product quality. 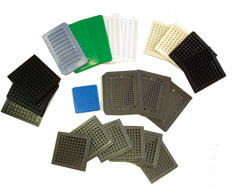 Trays made with injection molding technology are used in a wide range of applications. For example, these include electronic components, precision components, optical components, electrical circuit sealing materials, ICs, crystal oscillators, medical syringes, magazine cases, engineering plastic, appliances, and daily necessaries. Furthermore, Iwaki's products are manufactured with an eye towards ease of use by customers. We will continue to meet customers' expectations by further expanding our range of material options, such as conductive materials that prevent static buildup (106Ω class, clear material). Below are the key points of developmen using Iwaki's injection molding technology. Injection molding technology makes it possible to mass-produce products with complex shapes! Although there has been a need for the mass production of products with complex shapes, it has unfortunately been a need that could not be met. However, we have established a system that uses injection molding technology to enable us to meet these customer needs. Iwaki can also make original products using injection molding! Iwaki can also make original products using injection molding. Our introduction of cutting-edge machining centers has made it possible for us to flexibly customize production to fit needs such as the need for products for use with automated machinery, industrial products, or vapor deposition and coating products. We can perform customization to meet customer requests! Let us hear your requests. We will do our utmost to use our injection molding technologies to turn them into reality. We do our best to meet customer needs, such as products with complex shapes, previously difficult to manufacture, or mass production needs. Iwaki's product development leverages the benefits of injection molding technology in various applications. We will offer products in a wide range of fields, from electronic components and precision devices to medical applications and appliances. We provide services that offer our customer with greater convenience while meeting their needs.